What-ever you call it, Infrared Thermal Cameras are an extremely versatile cost effective tool! Thermal Imaging or thermography (hot spot testing) is the process of using a special camera designed to look only for heat by way of infra-red (IR) energy waves. Thermal Imagers are now part of the Electrical Compliance Testers strategy for inspecting the integrity of electrical systems. 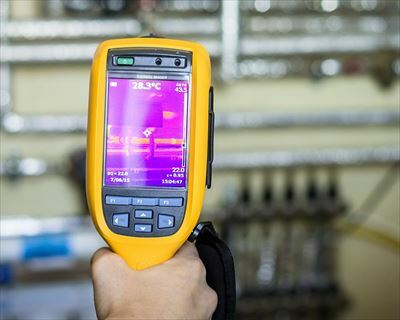 By detecting anomalies often invisible to the naked eye, thermal imaging has evolved into one of the most cost effective and valuable diagnostic tools for both predictive and preventive maintenance. The primary benefits of using an infrared thermal camera are twofold. Speed of operation coupled with the fact that thermal imagers do not require contact with the circuits or electrical components, has the advantage that they can be used when the system is under load whilst the equipment being tested is in operation. Most electrical thermography work simply compares the ‘thermal signatures’ of similar components. A ‘thermal signature’ is a measurement or snapshot picture of the heat that is emitted from an object at a specific point in time. It is particularly effective because equipment failures often have specific, clear recognisable ‘thermal signatures’ known as ‘thermal exceptions’. Under normal conditions three-phase electrical systems almost always have easily understood ‘thermal signatures’. Likewise, in the case of an abnormal or suspect condition or ‘thermal exception’, the failure will be evident even where visible inspection shows very little, if anything at all. Although the root cause of ‘thermal exceptions’ may not always be understood or even detectable, there is no doubt that the heat produced from high electrical resistance typically precedes electrical failure. A thermal image will clearly identify these potential problems. By reviewing thermal images of equipment, decisions to either repair or replace equipment become more effective by increasing equipment reliability and overall costs reduction. The regular testing of electrical systems is of the utmost importance, particularly when excessively high running costs or downtime could be detrimental to the business. They can be used absolutely everywhere from domestic installations to testing inside complex industrial-based systems, making them an incredibly versatile testing tool.